It looks like these fellows may be out of their league. The word “level” gets bandied around a lot in D&D. One use involves deliberate parallelism: character levels and dungeon levels. It’s expected that the monsters on any given level will be a fair match for PCs of the same character level. So when your third-level PCs hit the third level of the dungeon, they’ll encounter 3 hit die monsters that’ll give them a good workout without demolishing them. And yet this isn’t actually the case. Part of the challenge of old-school D&D lies in the subversion of this expectation. Sometimes you’ll tackle unexpectedly weak opponents that’ll drain your resources without giving you much reward. And more importantly, sometimes you’ll run into enemies much stronger than you are. At this point, you’d better be ready to get lucky, use up precious one-shot magic items, run away or die. “A monster’s level is only a guide, and a monster could be found anywhere in a dungeon, whatever the level. However, as a general rule, it is useful to limit monsters to 2 dungeon levels higher or lower than their hit dice. 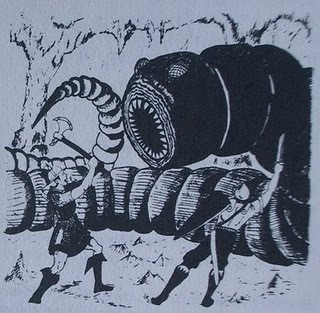 When monsters are encountered on dungeon levels less than the monster’s level, there should be fewer monsters than normal. And when monsters are met on dungeon levels greater than the monsters’ level, there should be more monsters than normal. EXAMPLE: A 4th level monster might be found anywhere in dungeon levels 2 through 6, but it is not likely to be found on the 1st or 7th levels except one at a time (on the 1st level) or in large numbers (on the 7th level or below). OD&D is more precise, presenting a matrix for determining which level’s random encounter table you should use. For example, on the second dungeon level, you’d roll 1d6. Roll a 1, it’s a first-level monster. Roll a 2, it’s a second-level monster. Roll a 3 or a 4, it’s a third-level monster. Roll a 5, it’s a fourth-level monster. And if you roll a 6, it’s a fifth-level monster. And then you get the Monster & Treasure Assortment, at which point all bets are off. As you can see, there are some freakishly powerful adversaries to be found in the Monster & Treasure Assortment. There are three distinct 6-hit die entries on Level Two. Level Four gives us 9-hit die stone giants, and Level 5 gives us the 10-hit die black pudding, our first dragon, up to four ninth-level Magic-Users and one shockingly puissant eleventh-level M-U! Clearly this isn’t the modern 4e “fair and balanced” monster table. The old-school dungeon is much wilder and less predictable. When you delve into such a dungeon, watch your back and be ready to run! Which “fair and balanced” 4e monster table are you talking about? 4E has sections in the rulebook that more or less state what the quoted sections do, but I’m not sure I’ve ever seen a set of encounter tables. I haven’t read the 4e DMG in some time, and my memory is unreliable. Please disregard that statement if it was made in error. Running back through the dungeon, of course, is not without it’s own risks. I wonder how much I’ve been trained by games of the 1990’s, but it’s difficult for me to suppress the idea that, if things are insurmountably deadly, I have made a strategic mistake. But a wraith on the second level of a dungeon? It feels like playing a game of Global Thermonuclear War. Now, that raises the possibility of an interesting corollary to the Mule’s other thoughts on D&D and the post-apocalypse: Things are desperate and futile; your characters are all going to die. The only way for your character to win at dungeon delving is not to play. Is OD&D so fundamentally Cold War that fatalism bubbles up from the ground of its mechanics? Note that each level has 100 entries. Most of them are not, in fact, wraiths. Also note that OD&D presumes much greater access to hirelings than in Basic D&D. As to your ’90s training, I think that the most salient issue is that combat-oriented gaming in that era presumed — or seemed to presume, in the hands of inexperienced DMs — that encounters existed for the sake of combat, and combats were meant to provide challenges on par with the party’s skills. OD&D presumes that many encounters are meant to be avoided! The strategic error does not lie in entering the dungeon at all, but rather in assuming that any encounter is something you should face head-on. That wraith is something you should run from or placate or trick. Your suggestion of fatalism only applies in a game where you do nothing but fight. Re: post-apocalypse, the highest hit dice monsters in OD&D are purple worms and oozes. I like to think that they are the secret masters of the world and humanity is just a kind of fuzz that has sprung up on the outer shell of the orb; the masters are mostly too busy struggling over the wholly tunnel-riddled interior to notice what happens on the surface. Remember, Lovecraft is post-apocalyptic too, it just wasn’t a human civilization that departed! Re: fatalism, one of the key themes of sword & sorcery is mortality. Conan knows that you and I and everyone we know are all going to die, and that we should be grateful for seventh-level priests against whom we can strive to earn a hero’s death. Nice work, Eric. Delta has a series of posts [beginning with this one] in which he does this for OD&D, Holmes, and AD&D; the look at the much larger tables in M&T is interesting indeed. Is a 10 HD monster beyond the capabilities of 5-7 5th lvl PCs? I’m thinking no. I don’t think the toughies on those encounter tables are too tough. Certainly not as we delve deeper into the dungeon. Some of those critters are there to teach players to run away, parlay and employ hirelings. Most 1st&2nd level D&SD parties could stomp the hell out of a single 6th level MU. A single troll on third level, no biggie the PCs have surely learned about the utility of flaming oil by now. A lone 13th level MU on the 9th level = exp walking. How big is the 1st/2nd level D&D party that’s stomping the hell out of a 6th level M-U? Because I’ll tell you what: we fought one the other night with a party of 5 PCs and if it wasn’t for a couple of 4th level guys on hand, Wall of Fire FTW! Nobody below 4th level can cross a Wall of Fire. A single 6d6 Fireball vs a 2nd level party is devastating. Hell, the 6th level Magic Missile can one-shot almost anybody in the 1-2 range. Not to mention Charm Person, Sleep, etc. Unless that party gets the drop on him and is in melee range, I don’t think he’s a pushover. Aside from the bit about the wall of fire (unavailable to a level 6 M-U), I agree with cr0m. Sure, a careful or lucky party that gets the drop on a higher-HD monster at range can often take it down with little difficulty. But if the PCs lose initiative on a random encounter, they can be in big trouble. A first-round web or fireball can really spoil the party’s day, while a troll who’s leapt into the center of the party can deliver a sound thrashing — and throwing flaming oil at it can be hazardous to your fellow adventurers’ health! And even worse if the PCs stumble into the monster’s lair unawares, giving it warning enough to prepare. Even a ninth-level party would be expected to have some trouble dealing with a thirteenth-level M-U who’s had time to cast half a dozen preparatory spells before getting the drop on them. Of course, a higher-level party has the assets to avoid being surprised. An incautious ninth-level party shouldn’t have lived long enough to allow that thirteenth-level M-U to get the drop on it. It’s the lower-level parties that have more to fear. A first-level party is doomed if it allows a carrion crawler to get the first attack, for example. The wyvern can easily kill two second-level PCs per round, while its high armor class and hit points make it unlikely that the PCs can achieve a quick victory. And a pair of seventh-level priests can lead off with preparatory spells like striking and sticks to snakes, then hit the third-level party with hold person and silence 15′ radius. No and yes. These encounters are indeed there because they’re too strong for the party to have much chance of muscling through by main force. That is, in fact, the definition of “too tough.” I’m not saying that this is a bad thing! I’m saying that those who find the addition of “too tough” encounters to be counterintuitive should think again. Sometimes overkill is just the right amount of kill. Maybe he was actually a seventh-level M-U, or he got the spell effect from a scroll or other magic item? Wall of fire is a fourth-level spell, and thus is unavailable to any kind of sixth-level character… even a sixth-level pyrologist! Probably a scroll or something. Sneaky bugger.